Starting on pole, Taylor Holdaway led flag-to-flag to win the Sauble Falls Tent and Trailer Park Late Model feature on Saturday night at Sunset Speedway. To kick off the night in time trials, it’d be Nick Goetz setting quick time with a lap of 14.664 seconds ahead of Gord Shepherd (14.801), Billy Zardo (14.909), Mike Wilkinson (14.926), and Taylor Holdaway (14.971). Danny Benedict was sixth, followed by Paul Geniole Jr., Ernie Fumerton, Kendra Adams, Lane Zardo, Nic Montanari, Paul Maltese, Chad Corcoran, and Lorne Quackenbush. 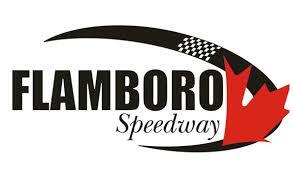 For 60 lap features at Sunset Speedway and to try and give drivers the most NASCAR Whelen All-American Series points, the top-two qualifiers start 11th and 12th in the feature, with the rest of the top-12 from time trials re-drawing for spots in the top-10. Taylor Holdaway drew pole ahead of Wilkinson, Adams, Corcoran, Billy Zardo, Quesnelle, Fumerton, Geniole, Benedict, Shepherd, Goetz, Maltese, Quackenbush, Montanari, and Lane Zardo. After a brief battle for the lead, Taylor Holdaway took sole advantage on Lap 3 ahead of Wilkinson, with Quesnelle and Billy Zardo side-by-side for third. Quesnelle got the spot on Lap 4, with Corcoran getting alongside Zardo for fourth. Behind them, Geniole and Shepherd ran side-by-side for sixth ahead of Maltese. Zardo took fourth on Lap 6, with Shepherd getting alongside Corcoran for fifth. Shepherd would move into the fifth spot on Lap 7 ahead of Corcoran and Geniole. Geniole would then get alongside Corcoran for sixth a lap later, as Maltese and Adams battled for eighth. Maltese got the spot, with Goetz getting alongside him for eighth at Lap 10. Further up the field, Zardo ran fifth ahead of Geniole, Goetz and Maltese, as Benedict and Corcoran went side-by-side for ninth. Benedict got the spot on Lap 14, with Adams following him through as they went three-wide with the lapped car of Quackenbush. With 17 laps on the board, Holdaway led as Wilkinson and Quesnelle went side-by-side for second ahead of Shepherd. Wilkinson would get the spot on Lap 20 as Quesnelle got loose off of turn four. Shepherd continued to run fourth, as Zardo and Geniole went side-by-side for fifth. Geniole got the spot on Lap 22, bringing Goetz through with him. Zardo now ran seventh ahead of Benedict, as Maltese and Adams battled for ninth ahead of Fumerton, Corcoran, and Montanari. Adams would clear Maltese for ninth at Lap 25. Further up the field, Shepherd got alongside Quesnelle for third at Lap 26 ahead of Geniole, Goetz, Zardo and Benedict. Shepherd easily got the spot, getting alongside Wilkinson for second two laps later. Quesnelle now ran fourth ahead of Geniole, Goetz, Zardo, Benedict, Adams and Maltese. The caution would then fly as Maltese and Adams both went around in turn one at Lap 30. Holdaway got a good restart to keep the lead ahead of Wilkinson, as Shepherd and Quesnelle went side-by-side for third ahead of Goetz. Behind them, Geniole and Zardo were side-by-side for sixth. Geniole would get the spot, but it’d be Benedict right there to challenge. Benedict would then move into sixth on Lap 34 ahead of Geniole and Zardo. The shuffling continued with Shepherd taking third on Lap 35, as Goetz got alongside Quesnelle for fourth. Behind them, Benedict ran sixth ahead of Geniole and Zardo. Geniole got alongside Benedict for sixth at Lap 37, with Shepherd getting alongside Wilkinson a lap later for second. Goetz would move into fourth with 35 laps to go ahead of Quesnelle, as Benedict and Geniole continued side-by-side. With 41 laps on the board, Holdaway led Wilkinson, Shepherd, Goetz, Quesnelle, Benedict, and Geniole. Shepherd would challenge Wilkinson once again for second at Lap 43, as Fumerton ran seventh with Adams and Zardo side-by-side for eighth. Adams got the spot on Lap 46 ahead of Zardo, Montanari, and Maltese. The battle for second lasted six laps with Wilkinson keeping Shepherd at bay as Goetz continued to run fourth. With 50 laps on the board, Holdaway led Wilkinson, Shepherd, Goetz, Quesnelle, Geniole, and Benedict. Shepherd would once again challenge Wilkinson for second two laps later as Fumerton continued to run seventh ahead of Adams and Zardo. Geniole would then get alongside Quesnelle for fifth at Lap 55, as Wilkinson held off the latest challenge from Shepherd. Goetz would then challenge Shepherd for third, diving into a hole underneath him entering turn one that wasn’t quite big enough. The pair made contact, causing Goetz to go around for the caution on Lap 58. Taylor Holdaway got a good restart, leading the rest of the way en route to the victory. Gord Shepherd finished second, followed by Mike Wilkinson in third. Ron Quesnelle finished fourth despite sideways off of turn four coming to the white flag, followed by Danny Benedict. Nick Goetz finished sixth, followed by Paul Maltese, Ernie Fumerton, Kendra Adams, Nic Montanari, Billy Zardo, and Lorne Quackenbush.